Quantum computing is projected to unleash immense computing power, but to be able to exploit the quantum potential of light to process information, it is necessary to precisely manipulate photons. Scientists have found that nanocrystals might be the key to unlocking this required ability. More specifically, nanocrystals of unprecedented quality known as “quantum dots” seem to be the future of quantum computing. In a standard computer, calculations are founded on the "bit", which can have a value of either 0 or 1. In a quantum computer, the "qbit" or "qubit" can have multiple states at once, a '0' or '1' or both, thanks to a quantum physics phenomenon known as superposition. Most approaches to quantum computing look to hold photons in a state of superposition so a computer can perform several calculations in parallel, which can dramatically improve the speed of data processing. Superposition cannot be attained with a photon unless it is isolated, and therefore, sources of unique photon production are highly coveted. 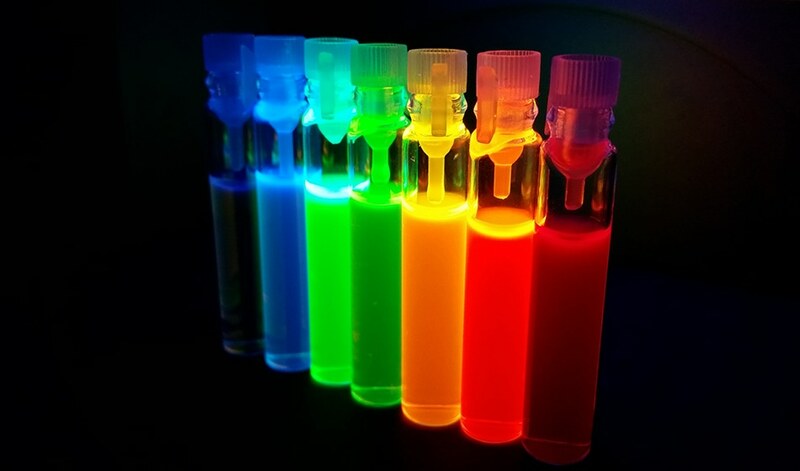 In a 2018 study published in the journal Nature, a team of international researchers showed an assembly quantum dots made from lead halide perovskites could generate an ultrafast and vibrant emission of light when triggered by a laser, a phenomenon referred to as superfluorescence. In addition to being useful in quantum computing, controlled superfluorescence demonstrated in the study could lead to new possibilities in lighting, sensor technology, encrypted communication. For superfluorescence to happen through an ensemble, emitters must spontaneously link their quantum mechanical phase with each other and act uniformly when excited. This only takes place, however, when those emitters meet strict requirements, like having matching emission energy, high coupling strength and a long coherence time. As a result of having these qualities, these quantum dots are strongly interacting with the other person but at the same time are not readily disrupted by their surroundings. Up to now, superfluorescence had not been achievable through the use of commercially-viable materials. The quantum dots used in the study, however, seem to be a commercially-appealing solution, one that is already used in advanced LCD displays. To reach their findings, the study scientists set up perovskite quantum dots into a three-dimensional superlattice, which allowed for the defined, collective emission of photons -- thus creating superfluorescence, the foundation for entangled multi-photon states. The distinct desired coupling among quantum dots calls for all dots having the same size, shape and make-up, and the synthesis of such high-quality quantum dots has been optimized over recent years. Using quantum dot sets of various sizes, the study team developed superlattices by precisely controlling solvent evaporation during the production sequence. The study's proof of superfluorescence came from optical tests conducted at temperatures of around minus 267 degrees Celsius. The scientists found that photons were emitted concurrently in a bright burst. The scientists considered these tests a starting point to further make use of collective quantum phenomena with this class of material. In another recent study, scientists revealed coupling lead trihalide perovskite nanocrystals with nanophotonic cavities can noticeably boost efficiency by a significant magnitude above what perovskites can emit on their own. The study outcomes offered a path forward for small on-chip light sources with decreased energy usage and size. To pair nanocrystals to the photonic cavity, the group drop cast perovskite nanocrystals in toluene solution onto a silicon-nitride cavity. They then triggered the setup with a pulsed laser, resulting in photon emission from the nanocrystals. Efforts to emit light with comparable materials have typically fallen short of successfully covering the visible light spectrum, with the wavelengths in the blue-green being especially troublesome. The device the study team demonstrated showed emission centred at 510 nanometres, in the green area of the visible spectrum. The ensemble in this study also produced a tenfold enhancement compared to the emitters alone.